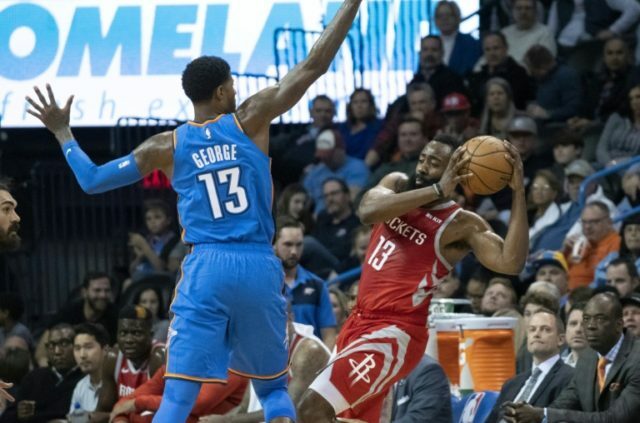 Los Angeles (AFP) – Paul George scored 20 points to lead the Oklahoma City Thunder to a seventh straight NBA victory on Thursday, a dominant 98-80 home triumph over the Houston Rockets. Even if he didn’t sound too enthused about his own performance, George was pleased with the Thunder’s performance overall as they continued their resurgence in the wake of an 0-4 start to the season. Thunder coach Billy Donovan said before the game he didn’t know when Westbrook would return to the court. But the Thunder star was a presence on the sidelines, energetically exhorting his teammates. Houston’s 80 points were their fewest in a game in coach Mike D’Antoni’s tenure. He scored two points — making one of his 11 shots as the Rockets, who led the league with 65 wins last season, fell to 4-6.